Have you ever tried a savory cocktail? Many of you are likely familiar with the Bloody Mary, a brunch staple that often comes loaded with a feast of garnishes. I've never been able to warm up to the Bloody Mary myself, probably due to the high acidity, spiciness, and overall heaviness of the drink. Other savory drinks I've tried have been an interesting experience but I wish I could have tried a little taste rather than having to finish the entire cocktail. 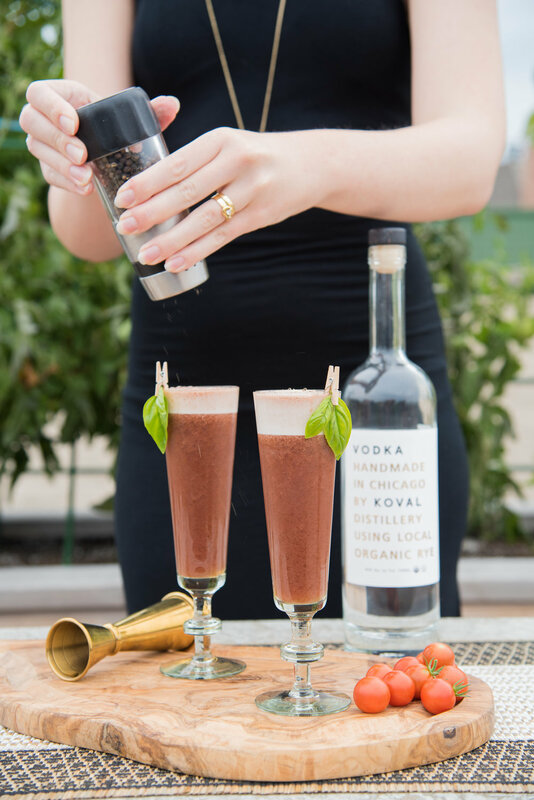 With the fall harvest of our rooftop garden bringing in copious amounts of tomatoes and basil, I decided to try my hand at crafting a savory, tomato-based drink that I could enjoy. My first dilemma was which particular tomatoes to use and how to best prepare them for the purpose. I started with cherry tomatoes and tried simply muddling them but wasn't thrilled with their sweetness or the inconsistent texture of the resulting juice. Grape tomatoes proved more savory, and I was able to get a great texture by blending them and straining out any remaining solids. You could probably use roma, kumato, or heirloom tomatoes as a substitute (let me know how your drink turns out if you do). Instead of making a typical syrup, I tested an infused salty solution with black peppercorns, fresh basil, and sea salt. I loved the manageable ting of spice added by the peppercorns and the freshness of the basil when paired with the tomato flavor. I further played up the basil aromatics by pinning some fresh leaves to the drink as garnish. Note that leftover salt solution could be a great flavoring component for a soup. I also incorporated balsamic vinegar as a complement to the tomatoes and basil. It helped pull together the creamy, yet tart finish of the drink while balancing all of the components. From the start, I knew I wanted to use egg white in this cocktail to test out the savory side of foam. The acidity of the tomatoes was sufficient for foaming the egg white and the resulting frothy finish created a striking visual contrast and a firm top layer for sprinkling with freshly ground peppercorn. For the spirit, I chose a vodka that would add character to the drink rather than getting lost among the other ingredients - KOVAL Organic Rye Vodka. This vodka is similar to KOVAL's white rye whiskey, but triple distilled for more smoothness. 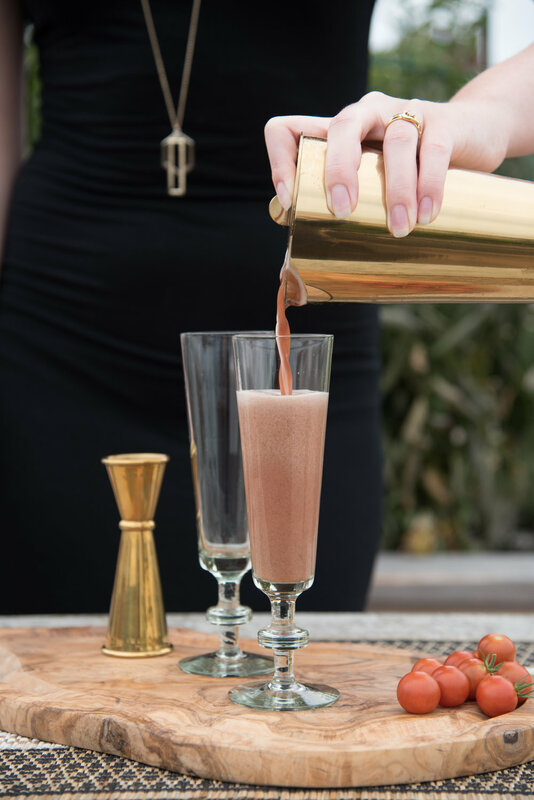 It blended beautifully into the drink while adding a depth of grain flavor that worked wonderfully with the savory palette. The finished cocktail is substantial yet fresh, with the creamy texture of the spiced foam blending effortlessly into the tomato body. The notes are lightly peppery, pleasantly acidic and aromatic. Blend and strain grape tomatoes, then add to a shaker along with other ingredients. Dry shake for approximately 10 seconds, occasionally releasing the pressure in the shaker. 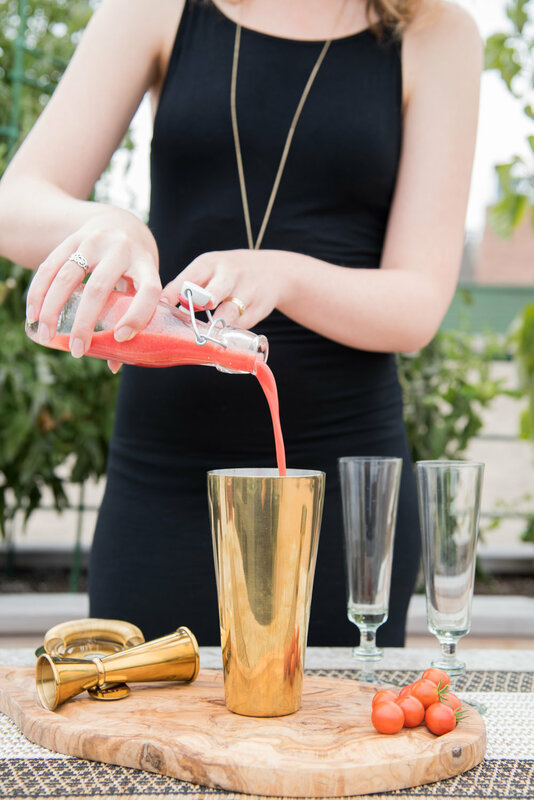 Add ice and shake until chilled, then strain into a champagne flute or other stemmed glass. Top with fresh cracked pepper and garnish with 1-2 small basil leaves. Enjoy while strolling through an abundant fall garden. *To make infused salt solution, add 1 cup water, 1 tbsp cracked black peppercorns, and 1 tbsp whole black peppercorns to a small saucepan and simmer for 10 minutes. Add several basil leaves and simmer for another 10 minutes. Allow to cool before using. Thanks to Belen Aquino for the stunning cocktail photography. You can find the West Elm items from this shoot, here, here, and here. The cocktail shaker and jigger are by Viski.